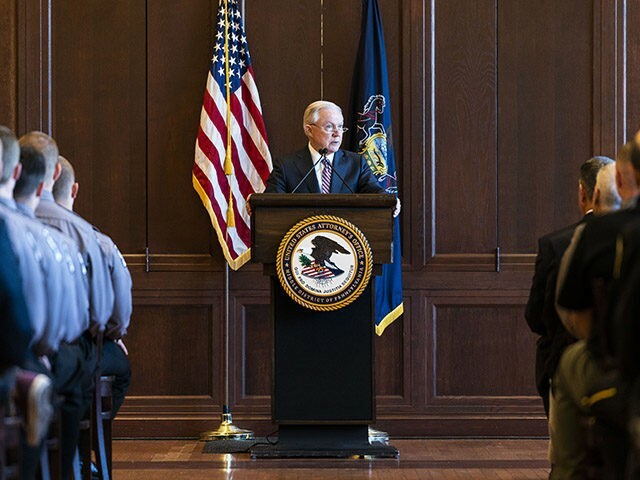 Attorney General Jeff Sessions praised FBI Director Christopher Wray’s testimony on the Justice Department Inspector General report while discussing immigration and law enforcement in Scranton, Pennsylvania Friday. Attorney General Jeff Sessions "real proud" of FBI Dir. Wray's statements on critical IG report. Wray defended the FBI Thursday in response to a scathing inspector general report that heavily criticized the actions of his predecessor in the Hillary Clinton email investigation. Wray said the report only addresses a specific set of facts and the actions of a handful of officials. He says “nothing” in the report “impugns” the integrity of the FBI workforce as a whole. “While the Inspector General didn’t find any evidence of political bias or improper consideration impacting the investigation under review, all of us at the FBI take this report seriously, and we accept its findings and recommendations, Wray said. “We’ve already taken steps to address many of the concerns it raises. We’ll change what we need to change and improve what can be made better and stronger, and we’ll move forward with renewed focus and determination. Because that is the essence of the FBI — we learn from the past, we get better at what we need to do, and we continually strive to be the very best we can be,” he added. The report released Thursday criticizes former FBI Director James Comey, calling him “insubordinate” and saying he broke with longstanding policy. It also criticizes the politically charged texts of a handful of agents.